I’ve noticed that visitors to Italy are often very fond of limoncello, which is typically served ice-cold after dinner. Sometimes in a restaurant a waiter will pull a bottle of the stuff from the freezer and plunk it on the table with some frosted glasses and our guests start cheerfully swigging it with gleeful abandon. Sweet and lemony, this refreshingly cold drink can be lethally strong, so I am constantly warning people to take it easy. Most people pay no attention, giggling as they pour a second or third shot. The next morning, breakfast is noteworthy for its complete absence of giggling. Emanuele puts limoncello into his category of spaccafegato drinks, which he colorfully translates as “crash-liver.” A more accurate translation would be “liver splitter”, so you get the picture. This comes from the fact that it is made with ethyl alcohol, and can often be 50% alcohol or 100 proof. He is also fond of noting that drinking ethyl alcohol straight can totally immobilize the nervous system, causing irreparable damage if not death, which is why most of the world tries to keep it out of the hands of teenagers, and it cannot be legally sold in many localities. But since Italians use this alcohol for limoncello, preserved fruits, and other spaccafegato concoctions, it is readily available. A bottle of ethyl alcohol that is 95% pure is sold in supermarkets in Italy, where apparently teenagers have better things to do than guzzle pure alcohol and fall into a coma. Limoncello does not take a lot of skill to make, but it does take time to let it steep and mellow. Make a big enough batch to give away as gifts and let the livers crash. You can put it into small attractive bottles and even design your own label, so it looks like something expensive, instead of fairly cheap hootch. In southern Italy, especially on the Amalfi Coast and in Sicily where lemons grow in profusion, everyone seems to have a recipe for homemade limoncello. 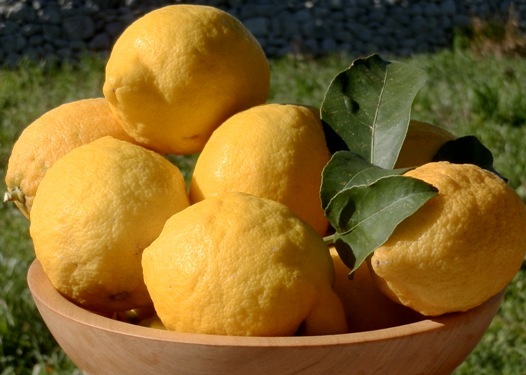 I am lucky enough to have a tree of fragrant organic lemons that make superb limoncello. Since you only need the lemon peel for limoncello, I freeze the lemon juice for summer’s lemon granita, make a lemon cake, or on rare occasions, go on a cleaning binge polishing my brass faucet. The basic limoncello recipe calls for lemon peel (only the yellow part) to be steeped in alcohol, then diluted with a sugar syrup, bottled, and if you’ve got the patience, aged before drinking. It’s the actual proportions of ingredients and timing that vary wildly. Some let the peels steep for 40 days and nights, beginning with a full moon, while others say it is ready in a week and peel their lemons in broad daylight. Some stir, some don’t. The amount of sugar seems to be according to taste, as well as the percentage of alcohol. Since I don’t like limoncello that is cloyingly sweet, nor split-your-fegato strong, my recipe makes limoncello that is pleasantly sweet with a lemony zing and about 33% alcohol (66 proof in the USA). One tiny glass still packs a punch. If you can’t find pure alcohol, get the nearest thing, which is often kept behind the counter at liquor stores. Then vary the amount of water to get your desired percentage of alcohol, one that will still keep your liver intact. Rinse and dry the lemons. Peel the lemons with a sharp knife or lemon zester, being careful to use only the yellow part of the peel, as the white part will make your limoncello bitter. Place the lemon zest in a glass container, add the alcohol, and cover with a tight-fitting lid. Hide it in a cool dark place for a month. Remember to check on it now and then and give the jar a little shake to distribute the lemon oil through the alcohol; after only a few days it will already take on a lovely yellow color. Bring the 2 liters of water to a simmer in a large pot, and pour in the sugar. Set aside to completely cool. Strain the alcohol & lemon peel mixture through a fine sieve. Strain the alcohol liquid again through a paper towel or filter-I do this by first rinsing my strainer, lining it with a dampened paper towel or several layers of cheesecloth, and placing it over a wide mouth jar or over a funnel. In a large glass container, mix the cool sugar syrup with the alcohol. Put the jar of limoncello back in its cool dark hiding place for at least a week and up to another month. If the mixture is cloudy, you will need to filter it again. Pour the limoncello into smaller bottles and keep one in the freezer for drinking, while the others can be stashed away for future consumption or gifts. The limoncello seems to mellow as it ages, so the longer you keep it the better it gets. I hope they have this in Puglia when we go-I had to wipe the drool off my face! Yes Pauline, we will make sure you get a limoncello fix in Puglia, so you can stop drooling! Mar23 I made a very similar homemade limoncello recently! Yours looks just perfect and full of bright, summery flavor. I’m planning on making mine into a cocktail with some champagne Thanks for sharing! Thanks Alexia – Hmmm, a limoncelllo champagne cocktail sounds intriguing..and powerful! I”ve been making limoncello like this for years. One other thing, though, is that I take the peels after I am done with the limoncello and boil them in sugar syrup to make candied lemon peel. After they boil for 5-10 minutes (until translucent, toss them in granulated sugar and dry on a tray. Then, if you want, you can keep the sugar syrup for a nice lemon syrup for crepes or pancakes. Hi Jeff – Always nice to hear from a fellow limoncello maker! Since I use a lemon zester which produces tiny shreds of peel, and I steep my lemon peels for at least a month, after that time the zest is crunchy and white and appears to be flavorless. I don’t think it would make a good candied lemon peel. Plus, candied lemon peel normally calls for part of the white pith, which I avoid when making limoncello because of bitterness. How do you cut your peel for limoncello and how long do you steep? Actually your limoncello recipe yields about 27% alcohol not 33%. You also have to take into account the weight of the sugar as well when calculating not just the weight of the liquid.. I have never tried freezing the lemon zest, but I THINK it would work – let me know! All of the flavor of your lemon zest should be in the first batch, so you cannnot re-use them, and I don’t know of another use. Hope you enjoy drinking your limoncelllo! I just plucked a 35 day soaked chip from my first ever batch. It packed a punch. I think the peels would make a nice garnish in a summer lemon based cocktail. I am making limoncello and was wondering if when it is done and all bottled for gifts could I peel a piece of the lemon peel off a new lemon to drop into the bottles? just so it looks really nice. do you think it would ruin the taste? I don’t think it would ruin the taste, and agree that it would look pretty. I’ve started this process but the peel has been steeping now for more than two months – is it likely to be ruined or do you think it might be ok? I think it should be fine – just continue with the process. Anita entroduced my wife Sandy and I to lemoncello in 1997 during our hikeing tour , which was a fantastic experience and our all time favorite vacation. We have been back to Italy a number of times and recently stayed in a Villa near Siena, but the Italian Connection tour is hands down the best way to see Italy and Anita did a wonderful job for us. We were in Montachino last week and drank a toast to your tour. Ciao from Texas ! Have you ever used homegrown tangerines instead? I have trees full of Meyer Lemons which I intend to use. Hi Susanna, Yes, you can use tangerines instead of lemons – I have tasted some that other people have made because my tangerines were used for marmalade (both delicious!) I am afraid that I do not know how to make the creamy kind of limoncello, but the clear kind should taste great with your Meyer lemons.